8.15 am, waiting outside the prison; dogs howling somewhere inside. Over the steel walls and through the rusty sharp wire I can just see the polytunnels. Over the last year they have slowly been dragged back to life, derelict for too long. 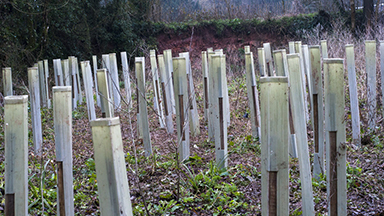 Now, they are resplendent – with new polyethene covering the old frames and veg seedlings just starting to grow. It’s a year since I first sat here, waiting for the giant doors to open and our first trainees to amble out, wondering if this was really such good idea (if you want to reminisce, click here and scroll right to the bottom). Today I sit here, more optimistically thinking the poly tunnels’ rehabilitation is a symbol for the progress that has been made this year and our improving relationship with HMP Channings Wood. BOOM BOOM BOOM. A car screeches up, doors open, noise intensifies, I catch the whiff of skunk and hear the ‘pssst’ as a can is cracked open. 8.25am. They race off. I don’t know how his resettlement will work out but for our guys, once they reach that date…it’s definitely a bit more structured. A lot has happened over the last year, many men are in a better place. Like the covering on the tunnels, that’s the obvious success you see. Beneath the outer layer is a frame, a structure. We have worked hard to get this in place – proper foundations to support the project. We have over 300 supporters, set up an Advisory Board that has the experience and contacts you could only dream of. LandWorks has a clear and budgeted (admittedly not yet fully-funded) plan for the next five years. Importantly we have now established a good track record and started to prove our worth. Our offer to support resettlement is being taken seriously by partners in both the Prison and Probation Services…they are including us in their long term planning. A great vote of confidence in LandWorks. Anniversaries and dates understandably play a big part in serving a prison sentence. But it’s what you do beyond release and beyond LandWorks that counts. Altering behaviour takes time; it simply can’t be done to a prescribed timescale. So the project is developing an offer of support beyond LandWorks, to help nurture and grow all this positive work. I start the engine, the prison doors are open, the men step out into the glorious July sunshine, we’re about to go, and it’s just another day. Today we are a year older and…it was a good idea!